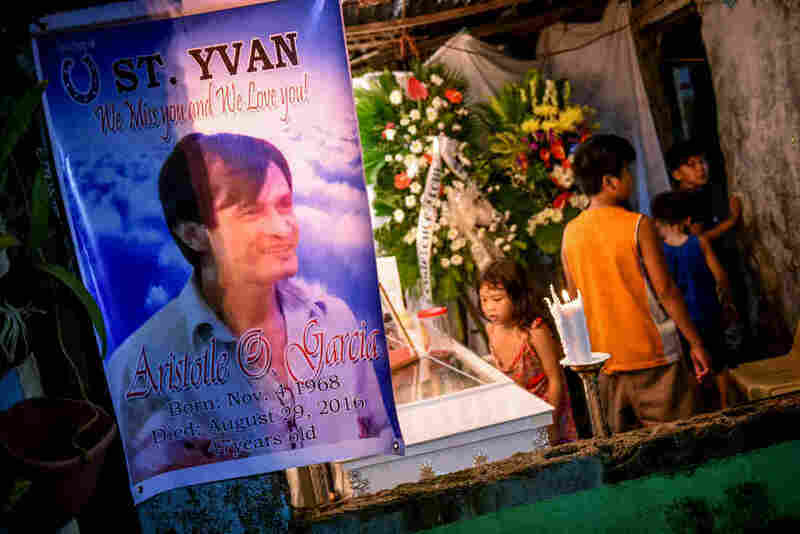 A Stark Choice For Filipino Drug Addicts: Surrender Or Risk Being Killed : Parallels More than 3,000 have been killed in the country's new war on drugs. More than 700,000 have surrendered to police, fearing for their lives. Police say those who surrender and stay clean will be safe. Lilibeth Diego, 53, a laundry woman who is married with three children, started using methamphetamine, or shabu, when she was 17. She recently turned herself in to authorities because she feared she could be killed under President Rodrigo Duterte's war on drugs. She says she has been clean for the past several weeks. 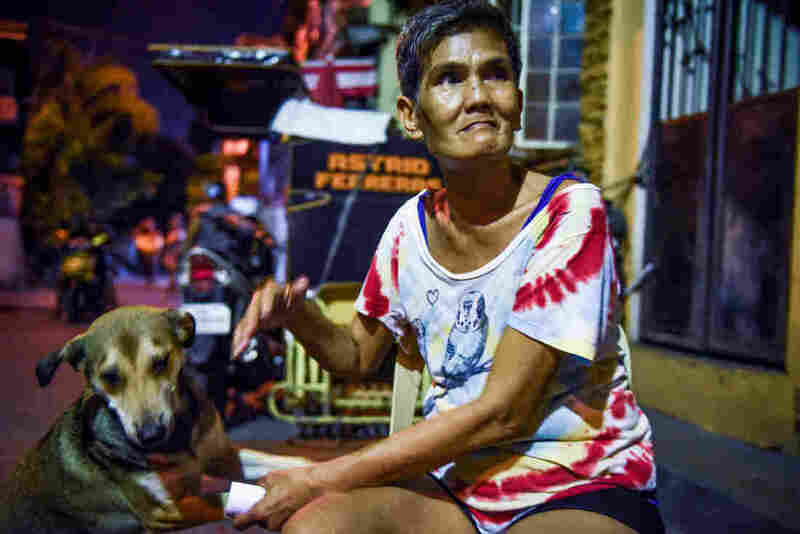 Lilibeth Diego lives in Malate, in one of Manila's seemingly endless slums. People are packed so tightly here, they often wash and bathe outside. Diego is 53 and has been a meth fiend, she says, since high school. "Every day since 1981," she says. And she's got the emaciated-looking face and lack of teeth to prove it. She swears she never dealt drugs. A few weeks ago, though, after recently elected President Rodrigo Duterte launched his war on drugs, she surrendered, along with her husband. She says it was an easy choice. "I'm scared to die," she says. She's so scared to die that she went to her precinct, signed some papers, got a briefing and was sent home. She says she's been clean ever since. In the Philippines, the official death toll in President Rodrigo Duterte's war on drugs has topped 3,000 since he took office in late June. At least half were killed in encounters with police, according to the country's police chief. The government says more than 700,000 people, like Diego, have surrendered. They're fearful of what the president's war on drugs might bring for them. That number has overwhelmed the government, which has neither the budget nor the infrastructure to help so many addicts. There are fewer than 50 government-accredited treatment and rehab centers in the entire country. Diego, like many of those who surrender, is required only to attend Zumba classes every other week. "Now that we've surrendered, we're being closely monitored," Diego says. "If we start using again, the cops will know. And they'll come after us." At the precinct station, the commander, Chief Inspector Paulito Sabulao, says those who surrender and stay clean are safe. "But I warn them," he says, "if they continue using — or dealing — they'll be killed." 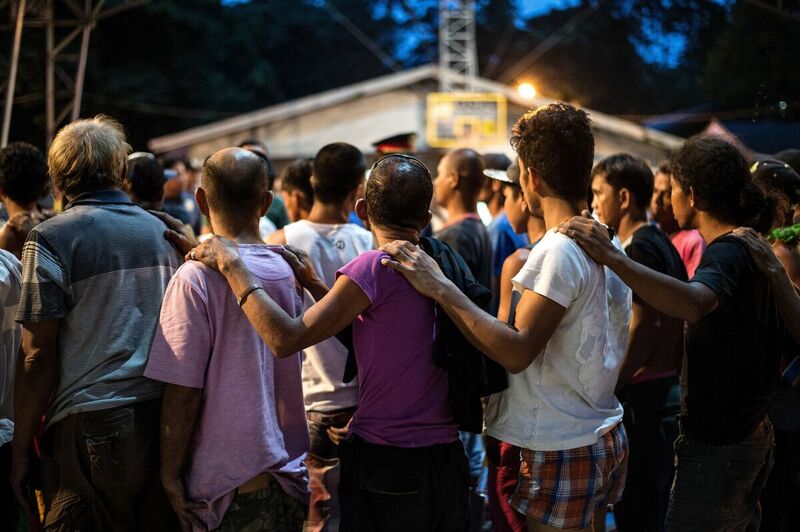 Alleged drug dealers and addicts surrender to authorities to undergo drug tests at Camp Karingal in Manila in June. Many Filipinos involved with drugs have died since President Rodrigo Duterte won a landslide election in May, promising to rid society of drugs and crime in six months by killing tens of thousands of criminals. For all his tough talk, though, Sabulao's cops haven't killed anyone since the war on drugs began 3 1/2 months ago. And that has gotten him in trouble with his bosses. "My colonel was under pressure from his bosses," he says, "and asked me why we haven't killed anybody. And he told me to start killing people who were known drug personalities. But I told him I didn't want to make any mistakes. I need to make sure that these people are really criminals." Sabulao says he favors a more community-based approach, reaching out to those in his precinct for help and guidance in identifying and eradicating the threat. More than 400 people have surrendered in his precinct, he says, since the war on drugs began. He's using them to learn more about the dealers who remain. It's a relationship based on trust, he says. And it seems to be working. In his precinct, petty crime has fallen to near-record lows, he says, since the war on drugs started. And there have been no drug-related murders, either. "If police start killing people, some drug suspects get paranoid they'll be next," he explains. "So they start eliminating people they believe might inform on them to save themselves. If we don't kill anybody, they don't kill anybody." Other commanders appear less cautious — and more eager to follow orders. Three-hundred yards down the street and down another alley, a few dozen mourners gather in front of a coffin. Aristotle Garcia, 47, was killed in an encounter with police two nights ago. The cops say he was dealing. His sister, Karen Rana, disagrees. The wake for Aristotle Garcia, a suspected drug dealer shot by the police during an operation. Garcia's relatives believe he was not a dealer, but a drug user who was set up. "No," she says. "He was a user." She says he didn't even deal a little on the side to support his own habit. "Nowadays, with this kind of situation that is happening everywhere, especially here in Manila, he will not do that. Because he's already afraid of being caught and killed." She pulls out her phone and displays the police photo of her brother's body. He's got a .38-caliber revolver in his left hand, and some banknotes lie next to his right hand. The police report says Garcia was trying to sell drugs to an undercover cop, but got spooked and pulled a gun. The cop, the report says, fired on Garcia in self-defense — six shots to the chest. Rana says her brother was right-handed, so the gun in his left hand makes no sense. She believes her brother was executed by police. Her surviving brother, Aaron Garcia, thinks he knows why. "He has information. He knows all the persons here. All the users here. All the pushers here," he says. He's convinced one of them set his brother up. But the cops are sticking to their story. There will be no investigation. The family is resigned to it. But even in their grief, they say they are not against Duterte's war on drugs. They only wish police would be more careful. Chief Inspector Sabulao, just up the block, shows me a list with 18 photos and names. These are alleged dealers, he says, from the community — identified by the community — and he's ready to move on them. "I only need them to resist," he says, grinning broadly. "I encourage them to resist." Because then, he says, "They'll be killed."